A clean, well-behaved pit bull is your best ally in renting. How easily you find a pit bull-friendly rental depends on you. Many landlords accept dogs, including pit bulls, on a case-by-case basis, though they won't openly advertise this in the rental listing. If you're willing to put in the legwork, you'll find a place for you and your pittie. Start searching early and keep your criteria broad. Waiting until a week before your current lease expires to find pit bull-friendly housing will leave you and your pooch in an unpleasant pinch. When searching, don't eliminate a potential listing just because it's a little further from work, doesn't include utilities, doesn't have assigned parking, etc. The broader your search parameters, the more likely you'll be to find an acceptable rental property. Call the landlord of a pet-friendly rental, but don't mention yet that you own a dog. Use this first phone conversation to establish yourself as a polite, responsible and interested tenant. This will only take a few minutes, but it's more likely to yield a positive response than starting the conversation by blurting out, "Do you allow pit bulls?" You want the first time your landlord considers your pooch to be when she meets him herself during the apartment tour. Look the part. Sadly, not every landlord has a positive, or accurate, image of pit bulls and their owners. That's why it's best to wait until your landlord meets your pooch in person before discussing rental details. Give your dog a good bath and a clean, festive collar. Showing up with your pup on a choker or prong collar suggests he's hard to control. Meeting your friendly, freshly bathed, well-behaved pit bull will ease your landlord's concerns that your pooch is aggressive and unruly. Present your landlord with a resume of your pit bull's information and accomplishments. Note if your pit bull's vaccines are current and include reference information from previous landlords or your veterinarian to verify your dog's gentle nature. Obedience certificates, therapy dog training and passing the Good Canine Citizen test all frame your pit bull as a nice dog with a responsible, caring owner. 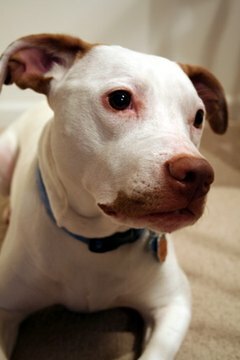 Offer to pay the difference in homeowner's insurance if your landlord agrees to switch to a company that considers pit bulls. When it comes to pit bulls, many landlords are concerned about insurance and liability. Some homeowner's insurance companies will make exceptions for pit bull who've passed the Good Canine Citizen test. Privately owned rental units are generally more flexible than major apartment complexes, which often have breed and weight restrictions. If the listing says "cats only," arrange a tour anyway and bring your pup along. It's worth asking if dogs are ever considered for responsible tenants. Even after meeting your adorable dog, not every landlord will accept a tenant with a pit bull. Politely accept the landlord's decision and move on to the next listing.